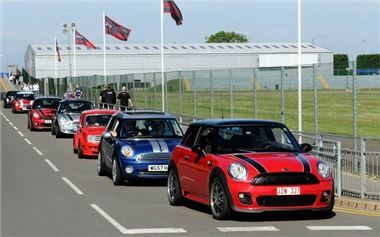 The international MINI community will converge on the former Formula One Paul Ricard circuit owned by Bernie Ecclestone at Le Castellet on 11 - 13 May 2012. MINI United time is here again. The international community growing up around the British small car brand is set to come together for the fourth running of a very special open-air festival. MINI has announced the date and venue for what is sure to be a spectacular event. MINI aficionados and music fans alike should set aside the weekend of 11 - 13 May 2012 in their diaries and programme the destination Le Castellet - or, more precisely, the Circuit Paul Ricard - in France into their sat-navs. Lying in wait for the MINI United 2012 crowd at the circuit, which played host to Formula One races over several decades, will be a top-class line-up featuring live music acts, motor sport, lifestyle action and MINI Community activities. Some 25,000 fans from more than 40 nations flocked to Silverstone in England for the MINI United festival in 2009 to celebrate not only the third Community catch-up but also the 50th anniversary of the brand's founding. However, the Circuit Paul Ricard in Le Castellet offers enough space for even the Silverstone masses to be exceeded in number. Indeed, the event programme is richer in depth and variety than ever before. Live appearances by leading lights of the international music and DJ scene, fun sporting activities, stunt shows and driving experiences on the track, exhibitions of accessories, current MINI and Classic Mini cars on display, and the exclusive presentation of a new MINI model ensure an attractive blend of al fresco party, shared experience and MINI action in every shape and form. strikingly styled members of the MINI fleet. Indeed, for the majority of the fans at the fourth MINI United festival, driving to the venue in their own MINI will be the perfect way of getting into the mood for a weekend among the MINI Community. Further information on MINI United 2012 is now available at www.MINIspace.com/MINIunited. Regular updates on the event programme, motor sport line-up and MINI Community will also be posted on the site, as well as tips and links on the event location, registration, ticket bookings and accommodation reservations in the area around the venue.